To qualify to become an Instructor of one of The Barefoot Masters® courses please read all of the following before contacting us. Become certified in one of the following courses: Ashiatsu Massage Bar or Floor, Bamboossage® Warm Bamboo Massage, Bamboo2Go® Chair Massage, Fijian Barefoot Massage or Stones2Go® Hot Stone Massage through a live course, unless you were trained through another provider then you may be eligible to take an online course. If you are out of the country, we can make different arrangements so contact us. Send a log sheet of 20 people you have worked on with their signature and date of session given. Send a video of you from your phone going through the routine while explaining what you are doing. It can be uploaded to a Youtube account marked private and giving me access. Also check to make sure there is not another Barefoot Masters® instructor teaching the same modality in your area. You should be a least 2 1/2 to 3 hours away. The Barefoot Masters® course of Ashiatsu Massage: Host one class with 3 students in your facility for Ashiatsu Massage Bar (requires overhead bars installed) or Floor Therapy. For Warm Bamboo Massage: host one class of 6 students. It will require two massage tables . Barefoot Masters ® Fijian Barefoot Massage: host 6 students. Fijian massage is done on the floor, so adequate space for two mats with enough room in between to put a chair. Stone Massage Instructor Training host 6 students. It will require to massage tables. Michelle Mace LMT or another instructor will travel to your facility for the Barefoot Masters instructor training. You will be teaching a part of this class. Please send log sheet of 20 sessions before class date. 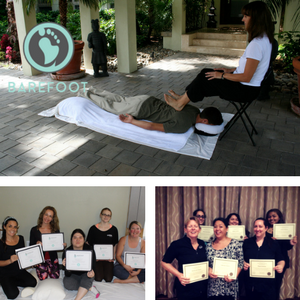 Upon passing this class, you will receive a certificate as a certified instructor of Barefoot Masters®. You then can submit for the license agreement. All proceeds from the hosted class go to the Instructor Trainer to cover traveling expenses and your training. Once the date for hosting a class is set, we will hold your spot for that area and not consider anyone else for instructor training in that area. Fill out and send notarized license agreement, certificate, check and required insurance listing Barefoot Masters , Inc. as one of the insured. AMTA (Americian Massage Therapy Association), ABMP,(Associated Bodywork and Massage Professionals), Massage Magazine Insurance Plus or Hands On Insurance cover teaching. The agreement below is to become an instructor of one of The Barefoot Masters® Course: Ashiatsu Bar Therapy Massage. For all others, a separate license agreement can be emailed to you. The cost is the same and a specified one will be emailed to you after hosting a class. Provider Ship: NCBTMB (National Certification Board of Therapeutic Massage and Bodywork). If excepted in your state for CEU’s or for students coming from other states that do, there is an additional $75. fee to come under our umbrella. Call to discuss. Upon receiving instructor materials. Submit 6 class dates for the year, that will be put on the website at no charge. Once you become an Instructor of The Barefoot Masters® course, you will be added to the Barefoot Masters® Instructor Private Facebook group, where you can talk with all the other instructors. Register and purchase class materials for each student via our online system. Submit evaluations filled out by students, a copy of certificate along with Sign-In Sheet to The Barefoot Masters®. Evaluations are now done online by students. No other instructor in your area will be trained in the Barefoot Masters® course you teach unless you submit less than 6 classes a year to teach or fail to renew. You will be added to the Instructors Only FaceBook Page, so you can receive support and updates from me and other instructors. Teach when and how many times you want to teach and decide what to charge. There are no percentages paid to Barefoot Masters, Inc. you keep all the money minus the cost of the educational materials. Courses taught to students who do not need CE (Continuing Education) hours are still considered students and paying for their materials is required. We recommend purchasing our online materials that include both Digital Manual and Video for $35., which is reasonably priced. However instructors can purchase hard copy materials: $50. for manuals and $30. for DVD. This does not include shipping costs. You want to teach, then teach. We develop the materials so you can do what you do best and that is to teach! Our license agreement is like when you went to massage school or college. The school purchases a license agreement to use the educational materials and each student buy their books. The teacher teaches by using the materials, however, they may not copy or change the book due to copyright infringement. We provide certificate templates and The Barefoot Masters® logos to use for advertisements. The license agreement for said modality is $399.99 with $75. for additional ones, and is good for a year with a renewal of $49. for each modality in your renewal year. This renewal date will be set up for automatic payment. If you decide to opt out, just call. We will add you to the instructor list on our website. You will need to send a head shot, work resume and a copy of your massage license. Please read: Ashiatsu Massage Classes and Where Can I Get Ashiatsu Training for addional information before contacting us. Hope this helps you to get started. Let us know if you have any questions. Submit a Certificate from either a live course given by The Barefoot Masters® Inc. with log sheet of 12 people who have received a full treatment of the modality. A home study or online course may be available if you have trained under another provider and submit a certificate of proof of a provider we accept. Submit proof of *Insurance that covers you for teaching like: Massage Mag, AMTA, ABMP or Hands On Trade Assoc. Fill out an application for using the Trademarks and Copyrights and pay the *$399. fee. And an annual renewal fee of $49. for each license. Additional courses are discounted at $75. per course. Ashiatsu Bar and Ashiatsu Floor are separate courses. There is an additional $75. fee to come under our NCBTMB provider ship every three years. Personality needed for teaching classes would include: Being able to follow instructions by reading all the information provided here and in the links provided. Resourceful: The ability to go with the flow when unexpected things come up. Can do Attittude: A positive attitude will project confidence. Leadership qualities: Taking iniatives. For Ashiatsu Bar: At least one set of stationary bars installed in the ceiling. (1) Templates of Routine Outline and certificate templates will be shipped or emailed for use in class along with a Sign-In Sheet. Added to Instructors Only Page, for those who come under Barefoot Masters® providership, where you will receive support from other instructors and tutorials in marketing. Every state has different requirements for its massage therapist. Some states like Mississippi only except their state provider ship. Most states accept NCBTMB (National Certification Board for Therapeutic Massage and Bodywork) If you need this info, please contact me regarding providing continuing education credits under The Barefoot Masters® Provider Ship. The cost of a digital manual and video is $35.00 and 8 0z Tube of Ashiatu Cream $10.00 plus shipping of all materials. Bamboossage Tool Sets are 10% off for Instructors and we need 3 weeks heads-up time for ordering and this too will have shipping charges. You will need to send a list and evaluations of all students that you have certified. For more information: Call Michelle at 239-352-8200 or click below. Thank you for considering to become an instructor of Barefoot Masters Course.